How to EXPAND your eBay Business GLOBALLY! Those of you who keep up with our Questions and Answers series will have seen that I recently received a question about selling to other regional eBay sites. You can take a look at it here if you missed it. And this question got me thinking – why not write an article on this very topic? After all, it’s something that nearly every business owner is interested in, yet so many people simply don’t know how to go about it (as evidenced by the question I received). For some niches/products, there won’t be any opportunities to sell internationally. Generally speaking, the smaller the items the better as small and lightweight items can be sent anywhere in the world at a relatively low cost, using Royal Mail’s Airmail international service. A perfect example is video games! I’ve seen huge success for some of my customers in this marketplace. Countries like Australia, some European countries etc. have much higher average prices for games than the UK which means this is a viable marketplace that you can take advantage of. (HINT: I’m not talking about new games only). BUT that won’t be the case for all products! Sorry, I don’t want to just blindly tell you that by listing internationally you’ll make 70% more sales as that’s simply not something that can be promised. It depends entirely on your individual business. Sometimes it won’t even be worthwhile and you should instead focus on expanding your product range and growing sales in your home market. After all, there is only so much time in the day so you have to focus your resources and efforts in the areas that will give you the highest reward. Alright, enough about that – I just wanted to be 100% sure you understand that listing internationally isn’t always the right decision and is not the best option for every business. But if it is, then the potential is huge. To put it simply, you’re opening your business up to many times more customers, which will result in many times more sales (if you do things right). Going back to the video game example I spoke about earlier; an Easy Auction Business customer of mine had so much success selling in Australia that it became his no.1 source of sales… more so than even the UK, and at much better margins as well! So the opportunities are there, if your business is suited to the expansion! This is probably the main reason why I don’t like the Global Shipping Program, as the postage charges are just too high! Of course this doesn’t affect you directly as you’re not paying for it, but your buyer is! This is a bit of a grey area, as for non-EU orders there should, by right, be import charges (unless the item is of very low value) but we all know that single orders often slip through customs without any charges or taxes. Not so with the GSP as eBay pre-charge these beforehand, which again adds extra cost to your buyer and makes them much less likely to order from you. Lastly, as you have to post the item to somewhere in the UK first, where it is processed and shipped on, the delivery times are significantly longer than if doing everything yourself. Though that does bring me to one good point about the Global Shipping Program – once your item reaches the UK shipping address, you are protected from any shipping related defects, which is a big bonus. However, all things considered, I am not a big fan of this program as I prefer to be in control of as many aspects of my business as possible and while I can see the allure of such an easy system, there are just too many negatives to make it worthwhile. To be honest, we don’t really need to consider anything else other than the fact that you will make MORE SALES when you list internationally yourself. After all, growing your sales and profit is the whole point in expanding, so why bother with this half-measure that while easier, also gives worse results. So when I talk about selling on international eBay sites, I mean listing on them DIRECTLY. I.e., if you want to sell to the German market, you go to eBay.de and create your listing there. Of course this is more work, but also offers much more reward. Always list directly on the regional site you’re selling to. Listing your products like this gives you MUCH higher visibility compared to simply listing on your ‘home’ eBay site and adding international postage options. Most people are put off from doing it this way due to them thinking it’s a lot of work, but really it isn’t at all and the actual listing process itself is incredibly simple. Firstly, your eBay user ID is universal, which means you can use it to login and list items for sale on ANY eBay regional site, just as you would on your ‘home’ site. For the specific job of creating listings on a site in another language, there are two main options for doing this, and they’re both very effective and easy. Open a separate tab with your own eBay site and use that as a guide (the layout is incredibly similar on all eBay sites). I’d personally recommend using both of the above options in conjunction with each other; that way you’ll have very little problems. I DON’T recommend listing on multiple international sites in one go. Instead you need to think like a large company, expand slowly and build your market share in each new region before moving on to the next one. That way you can build the systems and resources you need to make your expansion a success. That’s how I always suggest doing things on eBay – slowly, with a well thought out and long term plan. After all, we all know how severe the consequences are if you mess up on eBay (I receive hundreds of emails a week from people who have lost their entire business due to small mistakes!) so why put yourself in a position to fail? Simply put, if you go from selling in one country to ten countries overnight, you’ll overwhelm yourself and it’ll most likely end badly. So don’t do it. Choose one country to expand to first and proceed step by step. Plus when you proceed like this, you can do things properly! As there are some costs involved with international expansion (we’ll come to those in a minute). But now we’ve come to the next question – how do you choose which country to expand to!? And the answer to that is easy – our good old friend Terapeak. I’ve written about Terapeak a lot recently, and the reason for that is simple – it is by far and away the no.1 tool for any eBay seller and I personally cannot see myself selling on eBay without it. 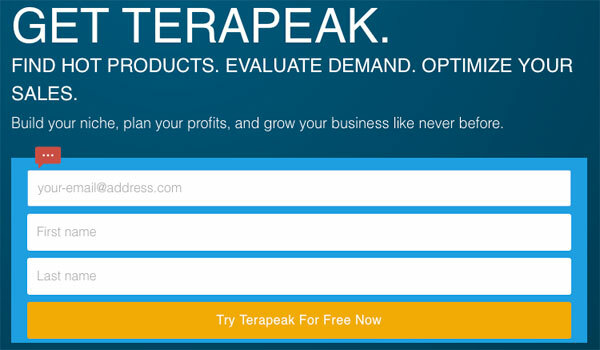 Using Terapeak you can make data driven decisions about every area of your business, from the initial market research and product sourcing, to pricing and listing format and everything in between. These are the 7 major eBay sites and using Terapeak you can quickly and easily find out which one is best suited for your products. Once you have pinpointed the best international site to sell on, the next step is getting your listings ready. We’ve already discussed how to physically list your products, but before that you need to get your listing(s) translated. Yes, this is going to cost you, but the rates are usually very reasonable, especially as eBay listings are one of the easiest things to translate. Of course it may not be worthwhile spending money on translators if you only have a few of that item to sell… but this just goes back to what I mentioned at the beginning of this article – international selling isn’t the right option for all eBay sellers. If however you have an established business selling a decent volume of products, mainly via GTC listings, then a one-off translation cost will be more than worth it in the long run. Especially if you’ve used Terapeak and are making a decision based on actual sales data, as that way you are significantly more likely to make sales and so there is less of a risk. Of course translating your listings is a one-time job, but what about support? Well international support is something that there is no real, perfect solution to. It’s not viable or practical to pay someone to translate/deal with eBay messages on an ongoing basis so unfortunately you just have to handle them as best you can yourself, utilising Google translate. Of course, a vast majority of your sales should go through without the need for any questions at all, but another thing I’d suggest is adding a quick line into your listing, under the Contacts section, where you specifically state that support is only offered in English (you should get your translator to add this line in when they’re converting the rest of your listing). English is a second language for many Europeans, so that way if you do get questions, they’ll often be in English anyway! Last but not least, there is the actual international shipping. Generally speaking, Royal Mail is best for small and lightweight items and couriers are best for medium or large packages. And then in your listings themselves, be very conservative with your shipping estimates. If Royal Mail estimate 5-7 days, then you should say 7-10 days for delivery. Under-promise and over-deliver! Another very important point – inform customers about any taxes or import charges that may be applicable as that is an easy way to pick up negative feedback (of course this isn’t an issue if you’re selling within the EU)! And that is pretty much it! I’ve covered all the main aspects of selling internationally and if you follow my advice, you can add to your current eBay sales substantially! With fairly cheap and easy postage to Europe and the fact that the UK is often much cheaper than Germany, France or Spain for many popular products, selling internationally can be a goldmine – if you do things right! If you have any questions or need some specific advice for your own business, don’t hesitate to post below in the comments section and I’ll do my best to help. Just a quick question… a lot of sellers on ebay sell internationally, and when I’m doing a product research on ebay to check out how many items were sold on a particular listing, I can’t tell how many were sold in US or in UK. Because if you go to each regional sites and pull up that same listing, same sold QTY is shown. Is there a way to find out? I have been selling on amazon fba and also recently enrolled for pan european markets and made a few sales in these markets. But a lot of forums state that selling internationally, other than just postage costs, that you need to register for VAT in each of these countries, maybe even 7-9 countries! Do you have any experience in this and should i opt out? Yes, if you use pan European fulfilment, you’ll have to register for VAT in those countries. There are help pages on Amazon covering this issue. But if you stick with UK FBA, you don’t have to do this until you reach VAT threshold in each country you sell to. Hi Andrew, have you looked at webinterpret.com they have translated listings for me in 6 marketplaces. Our sales have gone up for about 21% internationally to 35% over the last 6 months and sales in total are higher than last year. The way they do it is to charge a fee only if you sell and add it into the listing price, they also put listings with FREE shipping by adding that in the international listings from what you have put in the international listing within the UK (or home ) listing. So although the item may seem a bit higher than how you list internationally in the home site you don’t have to pay unless it sells and the fact they are listed as FREE shipping with a one off price buyers seem to like it. We have total control over listings through a dashboard where you can remove ones you don’t want to sell internationally as you can thought your home site. You can pick and choose which countries you would like to sell to also. Thanks Mark, I have seen them but haven’t checked out. Will do that in new year! “Firstly, your eBay user ID is universal, which means you can use it to login and list items for sale on ANY eBay regional site, just as you would on your ‘home’ site”. I’m in the US and have sold on ebay for over 15 years. Years ago I had a good mix of us and international sales. Now, I am lucky if I get 1 or 2 a month. I refuse to pay ebay .50cents a listing to have my items visible to the UK. I opted out of the global shipping due to complaints from international buyers and I don’t like not having control of my packages to my buyers. That being said, I still want to be visible to my international buyers. I apologize if you have written about it somewhere – are my items visible to buyers in the UK or should I have another account to list my items on the uk site? If you offer international shipping, your listings “may” show up on regional sites you ship to. Just curious if I go to eBay.com all your listings are visible there already? Does this mean I’ve listed them on the .com already? Hey Andrew. Do you have any experience with the international site visibility feature on http://ebay.com? Are you based in the UK or US? Hey Andrew. I’m based in the US. Trying to figure out how to branch my eBay store into international sales. Doing all the eBay sites individually, like you suggest, sounds like a lot of overhead for my small company and so I’m wondering if eBay USA’s “International Site Visibility” feature works better than eBay UK’s “Global Shipping Programme”. Thanks! I talked on the phone with eBay today and they told me a little bit more about the program. International Site Visibility is a new feature currently available for US sellers. If you are a seller in the US, you can pay eBay $0.10 – $0.50 USD per listing (depending on the type of listing) to automatically gain access to these limited international markets: Canada, UK, and Australia. What your paying for is to have eBay automatically do the posting while being able to control it all from your eBay US account. One listing will show up on four sites. eBay US listings already show up in Canada by default (only if international shipping is offered) and so you’re really only getting UK & Australia. This seems to be a feature that eBay may roll out into other international markets in the near future but the representative I talked to on the phone couldn’t give me an ETA on additional rollouts.